"of one of the biggest active volcanoes on the planet which has 1000 times the destructive potential ?" Define that. Is that like equating rare earth wastes to nuclear fuel rods as "dangerous", like someone did in this thread? Even if one of Hawwii's volcanoes blew as fully as St Helens did, you'd have a lot of deaths, and square miles of roasted rain forest...but in a decade or two things would be close to normal... not uninhabitable for hundreds of years, like the areas around Fukoshima or Chernoble. Low co2 emissions does not define "green". I'd say most of that is due to the angle of the panels - 30 degrees is steep for that latitude. It will probably produce better power in winter (which is when you need it anyway). For his location, 30 degrees from the horizontal is about right. Sydney is at 33 degrees south. That means the sun will make an angle of between 7 and 56 degrees off straight up, averaging around 33 degrees. So 30 degrees is biased slightly towards summer collection. You could make an argument that going to 25 degrees might increase summer collection even more (when both available sun and power draw is higher) at the expense of winter production (which is lower anyway) - but it's so close that it's not going to be a big change. The Chernobyl exclusion zone is the healthiest ecosystem in the Ukraine. Several species we thought were extinct now live there in large numbers. People live there; others take tours through it. From that perspective, the Chernobyl accident is the best thing to happen to that area ecologically since man arrived. Over 100 people live within the exclusion zone, and are in general outliving the people who stayed away. This is, of course, more a statement on the damage man does to the environment (and to himself) than anything about nuclear power being "good" for either - but claiming it is "uninhabitable" is alarmist nonsense. According to this website https://solarcalculator.com.au/solar-panel-angle/ ideal for Sydney is 33.9, or basically equivalent of the latitude. I've seen other formulas around, but even then, you may see some 30% change in output when for instance laying panels flat when they should be at an angle, but not 50%. That screams like there is some kind of issue with the system. Yes I agree there is more to it. I should also point out that my panels are used panels (about 6 years old) so they won't be delivering as much as brand new panels. I cannot claim to be an expert on RT solar performance, but i must say i actually "hope" there is something wrong here. Another 25 C , 95% cloudless, day today and again only 1.3kW max at 1pm. Visually the panels appear practically perfect perpendicular to the sun. Alarmingly, even the slightest hazy cloud (still bright sun) drops the output to 100 - 200W . This is after hoseing down the panels to be sure .....even though it rained 2 days ago. So i am with Bill on this, somethig is not right. Its definitely a cheap system, (who would install only 3 kW when you have enough space for 6+ ? )..install by the previous owner. But its only 4 yrs old, so ought to perform better. The solar doctor will be consulted ! Last edited by Hillhater on Mar 12 2019 1:37am, edited 1 time in total. A friend had a similar problem - turned out to be a corroded MC4 connector. Easy fix. Oh - Beastie, you might want to update your stupid meme. Most windfarms have better power density than that. Snowtown occupies 0.29 km2 and has a nameplate capacity of 370 MW. So a 1 GW wind farm will occupy about 1 km2. It's got a solid 40% CF, so lets be generous and call it 3 km2. Hey! That's better capacity per land than his permanent exclusion zone nuke plant/cancer factory. 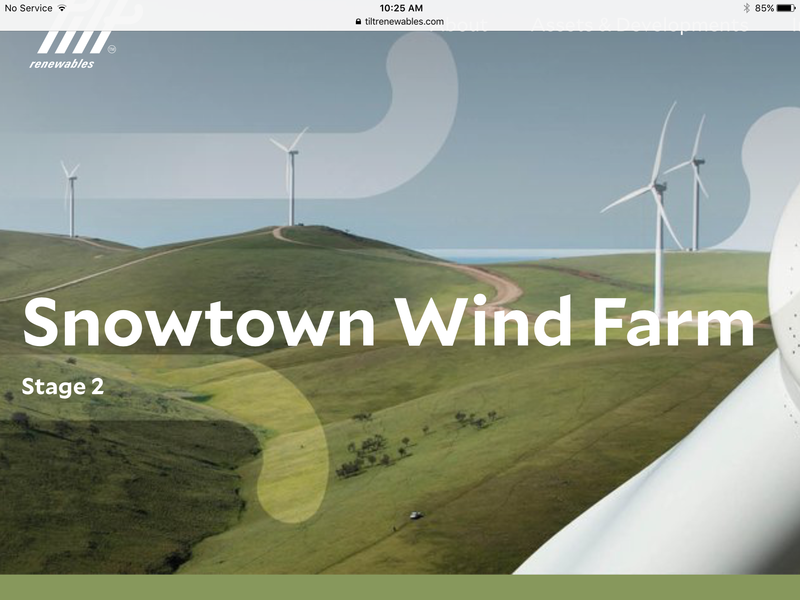 .... Snowtown occupies 0.29 km2 and has a nameplate capacity of 370 MW. So a 1 GW wind farm will occupy about 1 km2. It's got a solid 40% CF, so lets be generous and call it 3 km2. I know Wiki etc report the farm size as 0.29 km2 , but i wonder exactly how that is derived. .... and for reference, the lake at the bottom (lake Bumbunga), is recorded at 13.8 km2. Then this project fact sheet states that the farm is spread. " over 20km of the hil ranges" . So , a good estimate for 1 GW average output version of this wind farm would be that it needs another 220 km of similar ideal ridge top land. ! And also states that the "swept area" of the farms turbines is ...0.29 km2 !!! looking again at the map on ..
...it is obvoius that the windfarm extends over 30 km long , spreading variably 1-3km wide. Oh, and the windfarm developers also had to allocate another 104 ha as an "Environmental Offset"
Last edited by Hillhater on Mar 17 2019 7:13pm, edited 3 times in total. Then on top if you look at the REAL-WORLD DATA on wind/solar renewables you don't on any notable level actually cut co2 emissions. This is the amazing reality mainstream media and politics ignore.. Because its all about the politics and financial gains pushing this crap, not science or logic. Look at the emissions right now of Nuclear based France vs Germany or South Australia. This are CO2 emissions from electricity production in Germany and as you can see specific CO2 emissions have been falling from 764g/kWh to 480g/kWh and this happened while shutting down more than half of our nuclear power plants. Germany will also phase out electricity production from coal until 2038 (or 2035). It will start with shutting down around 12GW of coal power plants until 2022. What would have happend if Germany would decide to stop building more RE and invest in nuclear power reactors instead? It will take around 20 years from the idea to build new nuclear power plants to have them generating electricity in the modern western world. There are enough examples around to learn from. We would need more than 50 nukes to make a significant impact. This would cost hundreds of billions of Euro before generating a single kWh. In the 20 years the investments in solar power plants and wind power plants will have been already repaid and they would have produced huge amounts of CO2 low electricity. Someone had better get that conversion plan moving,...there are still periods when wind and solar can only produce less than 10% of the demand. BUT... I thought the objective was to reduce actual Total carbon emmissions ..Tonnage PA.... Not "specific" emmissions. ? Germany seems to have stayed at round 300 MT PA , ....within 10% of where it was 20 yrs ago ? The last critical grid situation was in February 2012 and during that time Germany saved France from blackouts, not otherwise. When comparing France with Germany you always compare specific emissions. Now you say that's not a good indicator? German electricity production (not demand) increased significantly during the last 10 years, despite shutting down half of our nukes so far. We now export roughly 10% of our electricity production during a year. Emissions are still ours, that#s why spefic emissions get significantly better, but absolute emissions not so much. 10 years is also not a long period for changing an energy systems. within 10 years from the idea you will not build a single nuclear reactor. The long time scale involved is the reason why we need to hurry and use solutions that are quick to build and why it is not a good idea to wait for that brakethrough technology or magic unicorns. Available is solar and wind and as an interim technology natural gas instead of coal. Not available are magic nukes or fusion. Those who promate magic nukes promote staying with burning coal instead. It will take around 20 years from the idea to build new nuclear power plants to have them generating electricity in the modern western world. Yep. We should do both. Shortsighted planning got us into this mess; shortsighted planning won't get us out. We need both renewables and baseload to supply the grid, and nuclear and hydro are the cleanest sources of baseload power we have. And you can't build hydro in most places. Yeah that's what I suspected - Someone should really update that. I'm a big fan (hur hur) of wind farms but claiming the swept area as the total area of the farm is disingenuous. Even clicking around with the distance / area calculator on Google maps puts it at about 70 km2. At least the entire area can be used for grazing. Can't do that with a coal/nuclear facility. I was refering to just a week or so ago..Feb2019.. (its a regular occurance) , when 95% of germany's electricity was supplied by fossil/thermal generators as the wind failed. I do not recall making that comparason, but im sure it is valid anyway .. However, the whole purpose of the move to RE generation is supposed to be to reduce the tonnage of CO2 emmissions. So far, Germany has spent $200+ bn on RE subsidies alone with minimal impact on CO2 emmisions, whilst resulting in one of the highest consumer electricity costs in the world. Relying on NGas as a backup/base load for windless evenings, leaves Germany exposed to the whims of Putin. Any time you quote gCO2/KWh that's a specific emissions measure. Has China actually completed any commercial nuclear plant (from placing order to full operational status) in 10 years? And avoids the issue of actual total emmissions ! The "20 yr". Nuclear project is a a anti Nuke concept based on misinformation. Perhaps. Of course, you could say the same thing about solar. Get rid of the bureaucrats and the regulatory hurdles and you could put in a plug and play solar + battery system for half the price you pay now - and install it yourself in a day. Yeah that's what I suspected - Someone should really update that. "Swept area" is an engineering term referring to the area swept by the turbine blades. Now, I'm no geologist or cartographer, but on that google maps screenshot, the wind farm seems to occupy a hilly outcrop that doesn't look like it was even suitable for agriculture, let alone building on. But wind turbines work well on elevated areas like this. So, how can it be argued that wind turbines make inefficient use of land that would be better occupied by a nuclear or coal plant? A someone who worked in agriculture for many years, I can tell you that ridge is pretty barren and only suitable for light grazing of sheep. Seems a good use of the area to me. "Light grazing for sheep". It is probably better than 90% of SA land usefulness ! Not a strong standpoint guys ! Irrespective of how ferile or useful the land may be, im sure you are well aware the main objections ( not mine ) to Wind farms are "Environmental" ! Erecting a 70km2 wind farm on a prominent ridge just amplifies those environmental issues. I would be very surprised if there is not some "First People" group claiming the ridge has significant traditional significance and should be returned to its traditional owners ! All that 70km2 for a project that produces <150 MW on average, and often nothing, zero, nada, .. (such as this very moment !). ! Because the Hunter Valley looks similarly pristine?